I have an oil leak from the tach driver that is at the back of the right side camshaft. I can't tell if the leak is from the 12x14x3mm o-ring or one of the end caps. The end caps are made "leak proof" with solder. Has anyone remedied leaks from this unit and can share their experience? Thanks. John what end cap are you talking about.....i just restored the one on my ellena and have some pics if you need. Thanks Ed. There are two caps (upper middle of photo) that hold the drive shaft assemblies in place. Cotter pins go thru these caps to keep them locked in and solder is melted around them to act as oil sealant. leaking. Mine, like yours has a grease fitting for the housing, so i assumed not much oil gets back there, thus did not seal mine. I reinstalled the caps and add the cotter pin in it accordingly.....maybe some light sealant around the edges when your installing the cap could not hurt. 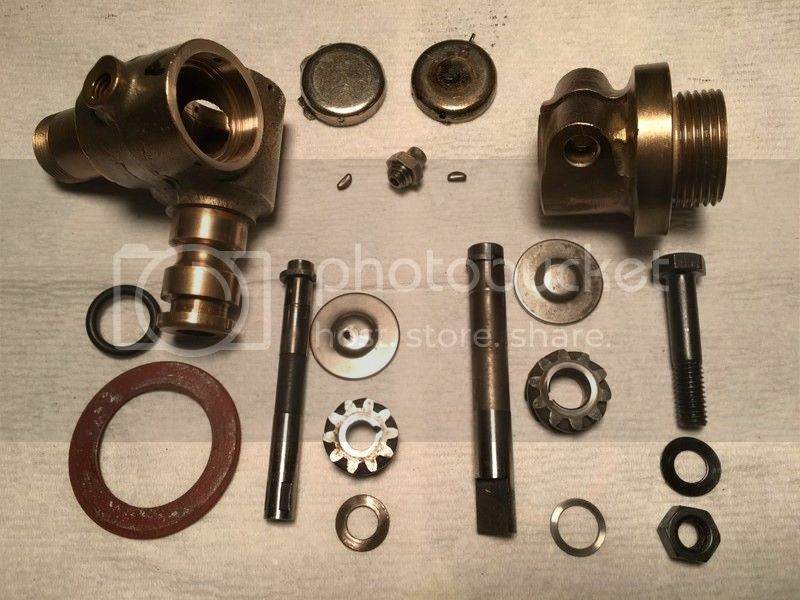 The end caps in your photo appear similar to freeze-plugs and as such might've been just intended to be press fit with no sealant required and cotter pins added for extra security. Perhaps the soldering was a service attempt to repair a leak discovered after the unit had been put to use. For correctness, my cotter pin when installed is spread in the middle to create a triangle look against the freeze plug/end plug. Was your originally like that? Mine was never apart and had the cotter pin installed that way and was black oxided as well. Ed: Your cotter pin installation is correct. My speedo driver was also leaking, but interestingly enough the end caps are threaded plugs. You can apply thread sealant and that stops the weeping. I tend to agree with Timo. These are originally pressed in and soldering may be a later "fix", but not a good one because soldering doesn't work too well on contaminated surface. I think I'll replace the steel caps with brass plugs. With cleaned and scuffed surfaces fresh solder will seal things nicely. 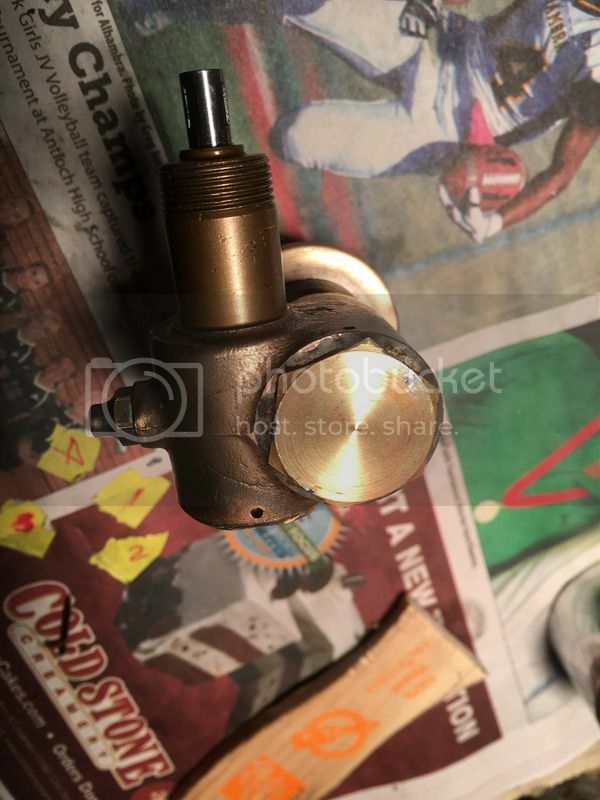 Personally, I wouldn't use solder for sealing it, but perhaps a light skim coat of urethane or similar type sealant between the housing and fresh/new expansion ("freeze") plug. Using brass expasion plug sounds like a viable alternative. Also, I'd take a good look at the locations of those cotter pin holes as they might be (part of) the cause for the original leak, especially if too close to the bottom of the expasion plug and more so if it originally wasn't pressed in all the way. My steel caps are too loose so I opted for brass plugs. The plugs need to be just so thick to account for the right amount of gear lash.